DNB (Den Norske Bank) is the major bank in Norway, a country with the second highest GDP/capita (http://data.worldbank.org/indicator/NY.GDP.PCAP.CD). On the 11th of December the DNB Health Care Conference was arranged together with Oslo Medtech at the headquarters of the bank in Oslo. At the Venture Session promising medical companies had the opportunity to present to large corporations, investors and business angels. GraftCraft was chosen to present at this venue as one of a limited number of start-ups in two sessions: an elevator pitch session and a longer company presentation. 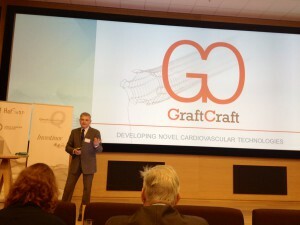 GraftCraft was chosen as one of three best Elevator Pitches. We are very thankful to the jury for giving us this acknowledgement!